Holidays are meant for adventure and relaxation, but there is one drawback for dog lovers, you have to leave your beloved pooch at home. Most hotels in Ireland do not allow pets, leaving the owner with the stress of either finding a dog-sitter or a kennel. 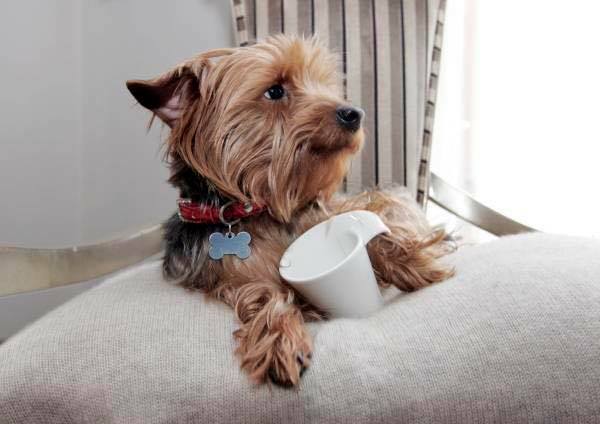 But, fret not, we’ve found some of the best pet-friendly hotels in Ireland. Seeing your four-legged best friend staring woefully out the window as you back out of your driveway is a heartbreaking sight for any dog owner. Of course you don’t want to leave them behind — you want to bring them along for the ride! There are multiple hotels all over Ireland that treat your pet as an honored guest, with specialized beds, doggie bags, and acres of land for your pet to run around. Here are some of the best dog-friendly hotels in Ireland. 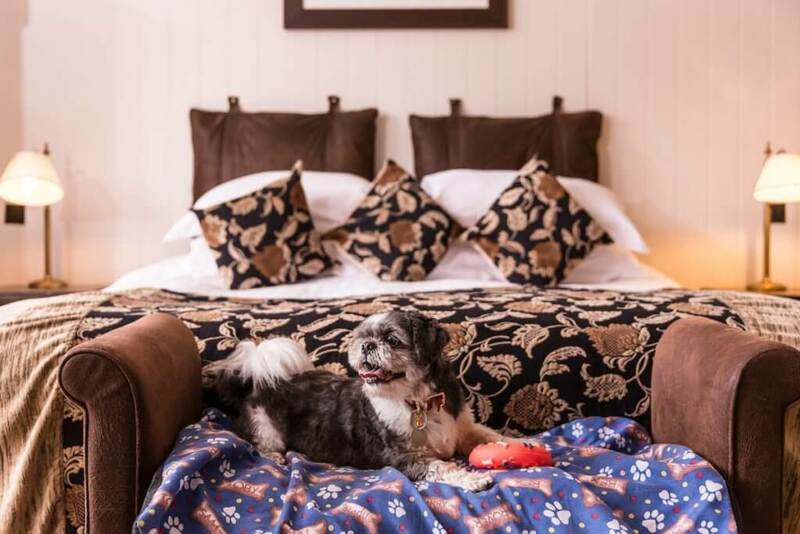 The Twelve Hotel is one of the most pet-friendly hotels in all of Ireland with their “Pampered Pet Program.” On arrival, your pet will receive a doggie bag that includes a toy, a treat, and clean-up bags. 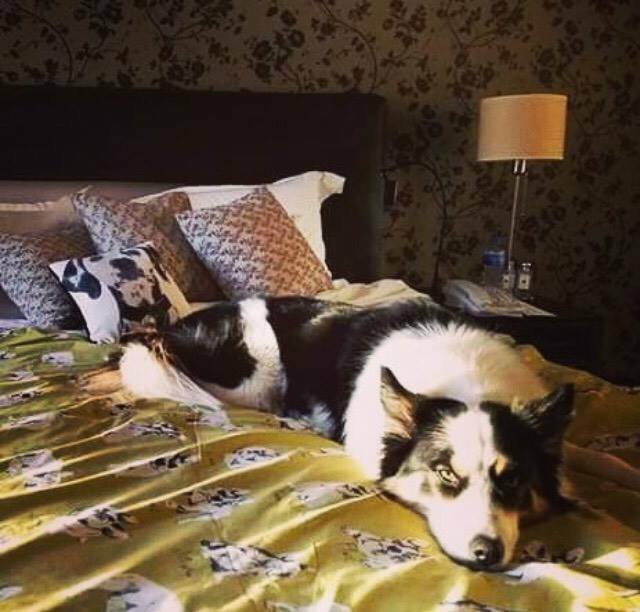 There is also a pet-friendly suite that has the extra space needed for a pet at no extra cost. 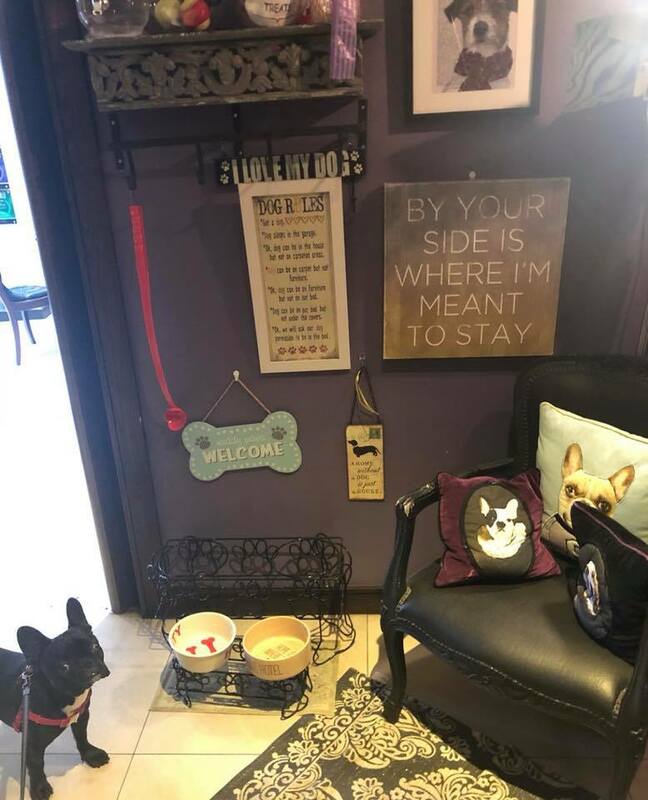 Along with the pet lobby, a luxury lobby just for furry friends that has toys, water bowls, bones, leashes and towels, this hotel also offers a pet menu for room service, a map of the near-by woods and beaches for walks and runs, and food and water bowls in the suite. To top it all off, The Twelve offers a “Pet Concierge” that can provide you with details and discounts on local dog walkers, sitters, groomers, dog boutiques and veterinarians. You do not have to pay for your dog or cat to be in the hotel, but you must put down a security deposit when you book. Pets are not allowed in the restaurants, and only one pet is permitted per room. Reservations must be made by calling (091) 59-7000. At Lough Eske Castle, the staff has a primary focus on keeping all guest comfortable, including owners and pets. Dogs and cats are allowed in the Guest Rooms and Garden Suites of the hotel, where they are greeted with a doggie bed, goodie basket, blanket, food, and a water tray. The hotel can also arrange for a dog grooming, a dog walking service, and, if your pet is ever to need it, a visit to the local veterinarian for a health check. The concierge will aid you in all of your pet related questions and needs. 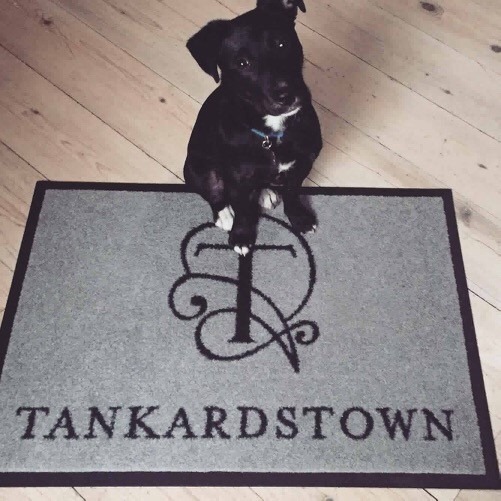 VIP treatment awaits your pooch at Tankardstown House (literally). This hotel has the VIP (Very Important Pooch) special that allows your dog to stay with you in their cottage suites. A complimentary treat awaits your friend at the door, and 80 acres of land lay just outside your door for you and your dog to explore. Tire your pup out by going for a run, playing fetch, or simply walking around the acres and acres of woodland on this relaxing estate. Dog-friendly Dylan Hotel in the heart of Dublin provides all of the luxuries that a human-guest would enjoy. The hotel provides pet beds, treats, and water dishes right in the room. Pet grooming, dog walking, and veterinary services can all be reserved by the hotel’s concierge team as well. The cost of having a dog is €100 per night, and the maximum size of each dog should be less than 30kg. The Lodge at Ashford Castle is the place to be for dogs and cats. With 350 acres of land right outside your doorstep, your furry family member will have all of the space in the world to run around and explore the countryside. The hotel provides pet beds, towels, food and water bowls, and complimentary treats. You can bring your own dog food, but there is also a special menu for cats and dogs provided by the kitchen, including “Scooby Doo Snacks” such as Roast Marrow Bone Stuffed with Peanut Butter, and “Garfield’s Grub” such as Salmon on Toast to name a few. The dog friendly rooms are meant for a maximum of two dogs per room, and each dog will cost €10 for the night. Guests are asked to place a €500 deposit upon arrival for the pets, and will receive the money back in full if no damage is reported from the rooms. Don’t want to leave your dog in the hotel room on your adventures? Here are some great hikes and parks that dogs will love. Killiney Hill is a small park in Dublin that is perfect for dogs. This park has extensive walking trails where you can walk your dog off the leash. With breathtaking views of of Dublin, the Irish Sea, Bray Head and the Wicklow Mountains, you will be able to enjoy the scenic routes while your dog runs about. Have your dog hop aboard your kayak and go for a joyous ride with Sligo Kayak Tours! Your dog will be able to experience the beautiful coastal estuaries and lakes of Sligo, and the jump off on to the islands with you and your tour group to explore. Routes include Ballisodare Bay and Seal Colony, Lough Gill, Glencare Lake and Dernish Island. You and your dog will revel in the beauty and grace of the landscapes, where you will see Knocknarea mountain and the grave of legendary Queen Maeve of Connaught, Glencar Waterfall, and stunning mountains and groves. Find out more information on tours and locations at Sligo Kayak Tours. Gleninchaquin Park in Co. Kerry has hundreds of acres of woodland, field, grass, streams, waterfalls, trails, rolling hills and lakes for you and your dog to enjoy. With some of the most idyllic scenery in Ireland, this park is perfect for owner and pup alike. The park encourages you to keep your dog on a lead around the livestock in the area, but will let your dog run free in the acres of fields devoid of the farm animals. There are also six different walking trails that range in difficulty and take anywhere from two to seven hours to complete, depending on which route you choose. Your dog is free to run around and explore on these trails without a lead. Coillte provides thousands of hectares of forest to toss the ball around across the country. Take your dog for a hike, and maybe even chill out and have a picnic while your dog roams free in the park. The forests also have a variety of walking trails and hikes thayouur and your dog and enjoy.